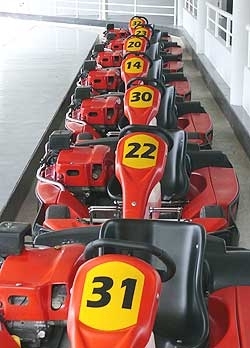 12 months ago I was inveigled by Gavin Charlesworth (the EBC Brakes man) into a social evening of playing with Go-karts. I am never doing it again. I have to say that the organization by the EasyKart people of the racing track and karts at the Bali Hai pier was excellent, complete with a TV monitor showing you which kart you had been allotted. Before you go out, you grab one of the several helmets from the racks, each one rather well used and sweaty. Being a doctor, I also hoped that the previous wearer did not have any communicable diseases, giving it a good shake to dislodge any nits it might have been harboring. Now, since we all went out in single file, it was a little difficult to see just where GC was in the line, but I did know he would be going for it, but so was I. “Age, experience and animal cunning beats youth and enthusiasm any day,” being another of my mottos. Now you also have to understand that this was a night race. Never mind the Singapore Grand prix held under the lights, this was the Pattaya Grand Prix under lights. However, the local lights were not quite as bright as Singapore, so I had difficulty spotting the back of the Charlesworth head in the semi-darkness. Or perhaps it was my age? But wait! Yes, there he was, and I set off in earnest. That he had a faster kart was without doubt, pulling away from me down the straights while I closed up under brakes, as any crafty old driver would do. And now comes the episode with a certain chap in a blue shirt. I was braking for a hairpin, while concentrating on how I was going to pass our trusty organizer, when I suddenly received a go-kart up my rear at full noise, using me for brakes. After recovering my breath and desperately squeezing the kart away from the wall on the outside, I looked ahead and Charlesworth and his mate were gone. He was in a blue shirt, and if we had any more laps I would have waited for him to extract revenge, but time was up. I looked for blue shirt afterwards, but in typical Thai way, he had “fled the scene”. But I can wait, oh yes, I can wait!